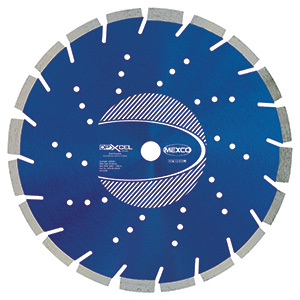 A diamond blade for superior cutting performance on abrasive materials. Ventilated and dual bond diamond segment enables cutting at a faster speed. Specially designed for builders and construction workers who cut on a regular basis. Manufactured using the latest techniques and ingredients including undercutting protection, dual bond diamond segment configuration and laser welded segment attachment, this blade is the best in its class. Terrific performance, long cutting life, with cost per cut significantly reduced due to the superior design and manufacturing process.